Mount devices perpendicular to rail to save space. These sturdy steel DIN rail mounting brackets are useful for mounting a wide variety of devices onto standard 35 mm DIN rail. 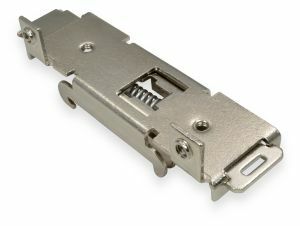 Their unique feature is the threaded mounting tabs oriented perpendicular to the DIN rail, allowing perpendicular mounting of devices and saving valuable space on the DIN rail. Mount hubs, routers, and many other devices which would normally consume horizontal space. These brackets very easily attach and detach from a DIN rail while maintaining high rigidty and load capacity. The bracket latches onto both the top and bottom lips of the rail with the fixed (non spring-loaded) end of the bracket on the top of the rail to bear the weight of its device. There are two ways to remove the bracket from the DIN rail. First, you may pull the sliding release handle to release the latch mechasnism. However, if a bulky device is mounted on the bracket, the release handle may not be accessible. In this case, it is easy to simply push up on the assembly, pivot the top out away from the rail, and lower the entire assembly off the rail. This is a very simple and convenient option. The DINM30 contains four M4 threaded mounting holes (two on the main body of the bracket and two on the right angle mounting tabs). Winford offers M4 machine screws (sold separately below) that work well with these clips. We offer metric mounting hardware for the threaded holes on the DINM30 clips.